A parliamentary report of 1777 recorded a parish workhouse in operation in Downton for up to 140 inmates. County of Wiltshire: Alderbury, Britford, Clarendon Park, Coombe Bissett, Downton (4), Fisherton Anger (2), East Grimstead, West Grimstead, West Harnham, Homington, Landford, Laverstoke [Laverstock] and Ford, Milford, Nunton and Bodenham, Odstock, Pitton and Farley, Salisbury, Standlinch [Standlynch], Startford-under-the-Castle, Toney Stratford [Stratford Toney], White Parish [Whiteparish] (2), Winterslow. Later Additions: West Dean (from 1883), Earldoms (from 1836), East Harnham (from 1896), Langley Wood (from 1836), Morgan's Vale and Woodfalls (from 1923), Redlynch (from 1896), New Sarum (from 1905), Old Sarum (from 1836). The former Salisbury Incorporation parishes of St Edmund, St Martin and St Thomas were also added in 1869. The population falling within the Union at the 1831 census had been 13,227 with parishes ranging in size from Standlinch (population 31) to Downton (3,652). The average annual poor-rate expenditure for the period 1833-5 had been £10,672 or 16s.2d. per head of the population. Alderbury Poor Law Union erected a workhouse on Coombe Road at Harnham to the south of Salisbury in 1836-7. It was designed by Edward Hunt who was also the architect of the Wilton Union workhouse. In 1836, the Poor Law Commissioners authorised an expenditure of £4,975 on the construction of the building which was to accommodate 280 inmates. Building.— The site is high, dry, and salubrious, and the accommodation is sufficient for the purposes of the union. There are two rooms which have lately been built for infectious wards, one for males, the other for females; they are at the back of the workhouse, and are communicated with by entrance from the garden. As very few infectious cases are admitted into the work-house, they have hitherto been found sufficient for the purpose. No infectious case is admitted into the body of the house. There are no separate sick wards for the male children, but there is one for the females. The ventilation and drainage are good, as is also the sanitary state of the house, and there is a sufficient supply of water. Furniture.— Mattresses made of cocoa-nut fibre, and beds stuffed with chaff, are supplied to all the inmates. There is a washing trough in every ward. Inmates.— The paupers are classified according to the order, and are divided into nine classes. The men wear coats, trousers, and waistcoats, of army cloth or fustian; the women, chambray and print cotton gowns, and all have the proper under clothing, stockings, &c. The men work at the pump, the will, gypsum pounding, and garden work. The women do the usual household work, and wash, and sew. The girls in the school are employed in needlework. The recreation for the boys is gymnastics, for the girls skipping ropes; and both schools walk out twice a Week, attended by the teacher. Medical Attendance.— All medicines, except cod-liver oil and quinine, are supplied by the medical officer. Nursing.— There is no paid nurse. The nursing is performed by the inmates, and I have heard no complaint of its insufficiency. Chaplain.— There is a chaplain, who gives the services prescribed by the order. The inmates, who are not members of the Established Church, attend the workhouse chapel by their own wish, and ministers of their own persuasions visit them when they desire it. School.— The children are entirely separated from the other inmates. Both schools are under the charge of a schoolmistress. Generally.— The only deficiency in this workhouse is a separate sick ward for boys; and a paid nurse ought to be appointed. The union expanded in 1869 when it absorbed the parishes that had previously formed part of the Salisbury Incorporation. 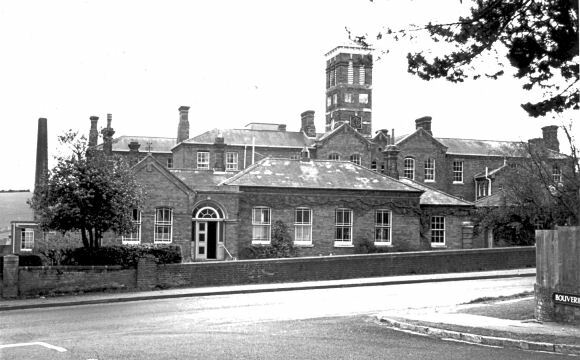 Alderbury union workhouse from the north, 1970s. By the end of the century, a chapel had been erected to the west of the main workhouse building. Alderbury workhouse chapel from the north-west, 2006. By the 1920s, the workhouse became known as Tower House Poor Law Institution. After 1930, it became a Public Assistance Institution under the control of Wiltshire County Council. A new L-shaped block was erected at the west of the site, and another block at the north of the children's building. By the 1970s, the site had been renamed Meyrick Close County Welfare Home. Virtually all the old buildings were demolished in the mid-1970s and housing estate now occupies much of the former workhouse site. 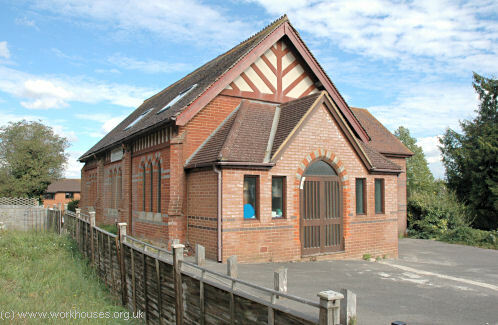 The much altered chapel survives and is used by a local church. Wiltshire and Swindon Archives, Wiltshire and Swindon History Centre, Cocklebury Road, Chippenham SN15 3QN. Holdings include: Guardians' minutes (1835-1923, 1927-30); Admissions, discharges and deaths (from 19th century until 1925); Births (1914-40); etc.